Kosrae has over 200,000 banana trees, and only 6,000 inhabitants. That leaves a lot of banana fiber going to waste. What better to do with it all than create beautifully crafted vegan wallets? American Matt Simpson arrived in Kosrae, Micronesia, in 2008 as a young volunteer teacher at the local high school. Falling in love with both the people and the island lifestyle, Matt, a keen surfer, didn’t want to leave when his contract was up. He realized that there were very few businesses on the island, and even fewer export products. Most of his former students were either unemployed, or working in the US for minimum wage. There were just too few opportunities on the island. Featuring designs by a local illustrator, Matt and his 13 employees create beautiful, intricately worked men’s, women’s and travel wallets. Made from 100% sustainable banana fiber, the wallets are waterproof, cruelty-free, and utterly unique. In the simple, open-air factory set amongst the banana trees in his back yard, Matt and his team hand make and sun dry gorgeous banana “leather” made from the island’s agricultural waste. Banana trees only fruit once, so Matt’s products are truly sustainable, and made from a renewable resource. Matt buys this “green waste” from over 75 families on the island, which helps to supplement their incomes. Before Green Banana Paper was even open for business, Matt had paid over $4,000 for banana tree waste, a lot of money on an island where the average yearly household income is just $18,500. Matt stresses however, that he doesn’t aim to replace Kosraean banana farmers’ traditional incomes, but give them an additional revenue stream, a bit extra, by buying a post-harvest product that would otherwise be discarded. He hopes to work with even more families, and employ even more people as his business scales up. Once the bananas have been picked, the tree is cut down and delivered to Matt’s beachfront home. The fiber is harvested, boiled to extract the cellulose, then pulped. Screens are then dipped into the vats of pulp, and laid out side by side in the equatorial sun. 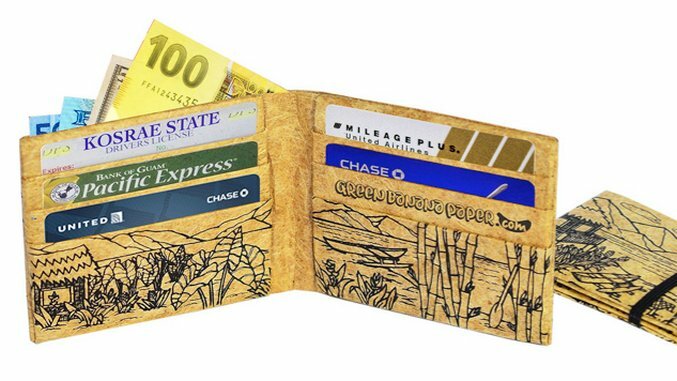 When the paper is dry, it is peeled off the screens, and cut into the wallet form. A silk screen is then used to layer on a local design for decoration, and then the wallet is coated with a thin paraffin wax to make this already water-resistant fabric even more water repellant, naturally. All the wallet seams are doubly folded, to make stress points more resilient, and the wallets very hardy. This labor-intensive, hand-made process means that every wallet is touched by every staff member of Green Banana Paper. This is the core of the business: building a product that will help, giving something back to the island that has given him a lifestyle many back home can only dream about. Kosrae has it all: surfing, diving and hiking on a tiny volcanic, jungle island surrounded by a reef bursting with tropical fish, coral, turtles, rays and sharks. It is a perfect 85 degrees, every day. Matt’s home and factory are just across the road from white, powdery sand, coconut palms and the waves. All this inspires the wallet design. So far there are two design themes, flora (flowers and bamboo) and castaway (thatched huts). But Matt has an idea to get the whole island involved in future lines. Green Banana Paper will host art competitions on a rolling basis so that anyone on Kosrae can submit ideas, and all winners will be well compensated for their efforts. The only design limit is that all illustrations need to be linked to Pacific culture. The arts run in Matt’s blood. His mother is a celebrated weaver, and her dedication to her craft has been a huge inspiration. So much so that Green Banana Paper has recently introduced weaving into its product repertoire. This might just reawaken traditional knowledge of banana fiber weaving on Kosraean, largely lost since the island began to mix with western cultures. Matt is still experimenting with what they can make, but is so far contemplating a purses range to complement the wallets. Home wares and other textiles might come in the future. Green Banana Paper also makes paper, of course: PH neutral, artist quality paper from banana, pineapple and taro fiber, either pure or mixed with recycled scrap paper donated by the local high school. As Kosrae doesn’t have formal garbage collection or landfill, every scrap that can be re-used helps to maintain the pristine status of this tiny island. Matt believes that Green Banana Paper is the only boutique paper mill in the Pacific. There are a couple of smaller-scale paper makers in the Solomon Islands, but Matt’s is the only business with job creation as a driving focus. He hopes that his Kosraean product can compete on the world stage, and provide not just paper-making skills, but business skills to others in his adopted home. Matt has been invited to share his business model with people on other islands, and he will, but not quite yet. Before he shares his craft with others, he wants to perfect it first. Green Banana Paper is a labor of love. Matt originally became a teacher because he was a bit lost in high school, and so wanted to help kids who, like him, needed a hand to find their own path. He is applying a similar philosophy to his business. The factory and the products the team makes is much less for Matt, and more for the community he hopes to serve. He had no previous paper-making experience before he founded the company: he has learnt everything from Google and YouTube. He has had all the equipment custom made and shipped to the middle of the Pacific Ocean. It has taken years to learn everything, he says proudly. It isn’t a get rich quick scheme for him, it’s a passion. Check out Green Banana Paper on Facebook and Instagram, or at greenbananapaper.com. Matt uses USPS Priority mail to send products directly to customers.